From this site I express my gratitude to those people that have taught me. It is true that in every tradition there is a transmition that has place in the colective unconscious, but frecuently this present wisdom has names and surnames. So, these are the faces of my teachers: Pedro, Antonio, Paco, Eloy, Paco, Custodio, Manuel, Victoria, Florencio y Loreto that have given me their knowledge and with it their wisdom. 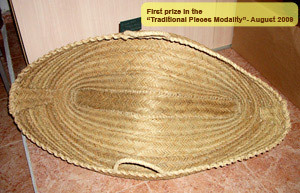 This website wants to remember to Pedro Ortiz Mármol because he was who taught me the rudimentary knowledge to weave the "pleita". 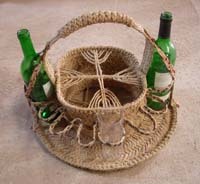 With only 7 or 8 years old, when his hands weren't big enough to reach the strands, he started to work with esparto. And, of course my great teacher, Antonio (nicknamed "Antonio de Capel") who doesn't know him in Campo de San Juan! Who doesn't know about him following his course in the way of life? His clues? 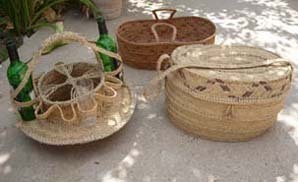 "capazos" (big baskets), "paneras" (breadbaskets), "barjas" (bags to take lunch), mats, "baleos" (to lay the hot pan) and his kind spirit. In my soul he leaves other prints, deeper marks from the so many meetings that life has conceded me with him. There is left the present of his permanent patience, his unwavering meticulousness. Thank you for this gift, Antonio. It will be difficult for me to forget Manolo (nicknamed "Manolo el Ventero") in Bullas. 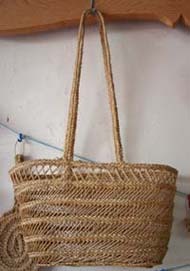 A very brieve meeting in which he taught me to weave "meloneros" (esparto bag for one melon) and transmitted me a particular task that I thought it was lost: the 8 strands string. 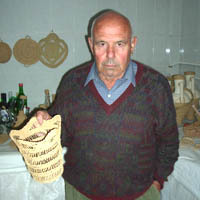 Juan, "El Sargento" also from Bullas, he helped me to finish the "cordelillo" (a task similar as when working wicker) that Miguel taught me in El Esparragal. 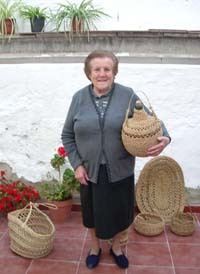 Margarita, who taught me the beginning and the end of "cofín" (the plait for "cachuleros"). Also it is part of my "heritage" as craftsman what I learned when I met Paco. He taught me the "beehive plait" and also to sew the invisible stitch "barja". Followed by the meeting with Pedro José from Albacete, very pleasant and very rich in transmitting knowledge. He has taught me some details that only "the elders" in a place know, like Paco, and only they are given that right , if they want, mostly because so has decided "the school of life". 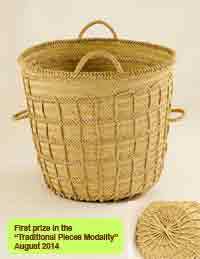 Thanks to him I know the "garibola" stitch (to keep ferrets) and something more about "soplillos" (fan for fire) and the beehive stitch. 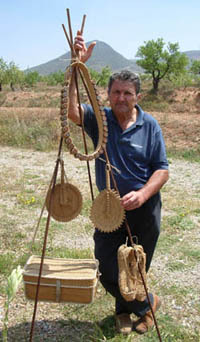 With Paco I could see another method to combine the pleita strands and to draw different weaving patterns to "plait" Thank you for being there Paco. There is always some work that seems to be lost in time and space. But well, at some moment comes the opportunity and it appears on my way. I thank Custodio from Albacete for his presence in my life; with him I have learned to plait "recinchillo" in a clean and fine way. "We have killed the peasant culture and we have not substituted it for anything, at least for nothing noble". 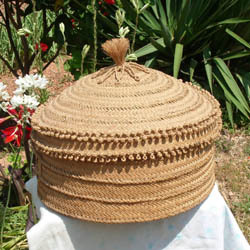 esp-arte: Esparto -natural fibre, wild- and art -the art of creating, the art of living Life harmoniously-. 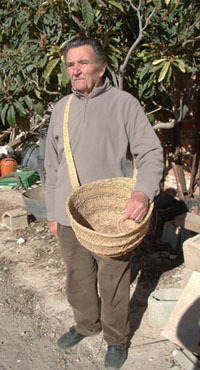 Pedro is a villager in the Lorca region. Although he is young he likes very much doing old craftsmanship. 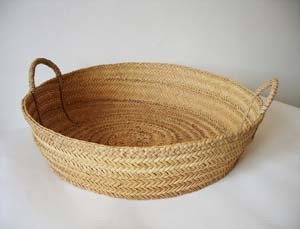 Making esparto utensils was a necessity of everyday life. Also, we can say that this not always gives him good memories. His childhood passed fast due to familiar necessities. With only 7 years old he walked with his goats in front of him. Shepherd for many years at the same time that he took care of the animals he made strings to lace the pigs (although very soon these strings were eaten for the pigs), the "recinchos" of beasts of burden that were damaged, the "pleitas" of spoiled "capazos" due to the hard work with potatoes, dung, soil, etc... and the "aguaeras" (pitchers to get everyday water). When time for school? When he grew up, at nights in the teacher's home named Calleja, when all was ready at home and night invited everybody to rest. Then, by the oil lamp he was beginning to learn the "a", "m"... and not in neat notebooks. Studying the lessons that his father gave him, Pedro did this in the "algarroba" chocolate wrapper that they ate; there he remembered how each letter was written and this was his training. Pedro is an important bridge between the farmers of past times and the first current generations at now. 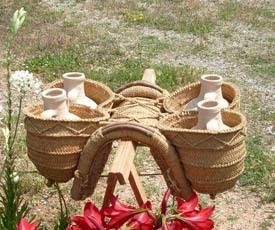 and every attention of yours when we plaited the carafes then. 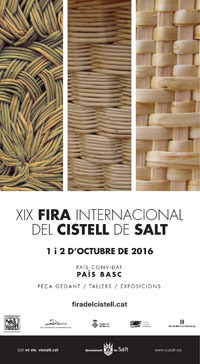 I thank you for your person and your work and perhaps it is possible that this craftsmanship so unique and lasting in our Murcia Region keeps still alive. What more can be said of Antonio that does not say his presence? Truly I am fortunate to get to know people like Antonio. This are people of "another world". So sometimes leaves us so little warmth the spirit ? What whether sometimes we have abandoned what really matters ? Antonio doesn't need any mobile phone to comunicate . His presence is a comunication itself. 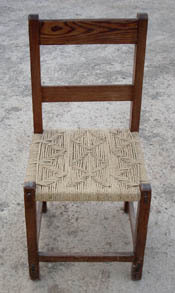 It is not only esparto craftsmanship what Antonio does; it is life craftsmanship what I have learnt from him. 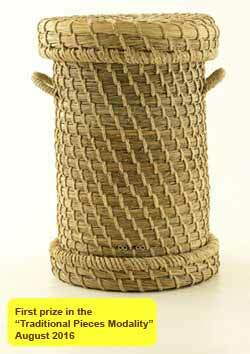 Esparto is only an excuse in his life to give all of himself to love simplicity and silence. 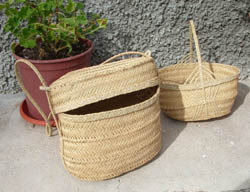 Antonio is not able anymore to do esparto handicrafts that have accompanied him in his life, but, all the same!. He is now learning to live in silence and stillness (we still have to do some work ). You 're ahead in finesse, Antonio , and when in your time you was doing daily tasks with Esparto, you maintained and cherished it by your care. His hands can't work like before and this is hard for him. 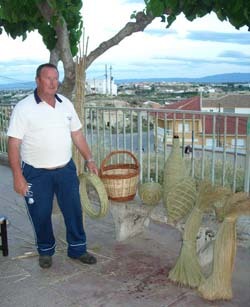 I won't forget the last day Antonio you could take the "esparticos" (little esparto grass) to teach me once again. And it is hard , if anything, more for us than for you, Antonio, because we can not see you working lilting your small hands. It was as music to watch the rhythm of your work and how I remember those moments! I have all this happiness by chance, like all real presents, when I met him in spring 1997. It was in "Campo de San Juan" (Murcia Northwestern region) where he has always lived. Since then, my relationship with him has been very affeccionate until today when he is 93 years old. He is small but his spirit is big. In his conversation you can find a great deal of simplicity. He is a true person and straightforward like his very presence. He is a country man in all senses; He was the one who did one’s hair, put injections, and tried to step out of the needs of their neighbours. He has done everything, he has given all he knows. Pure country man, he even pull through the charge of the work while working in Madrid; He climbed to the top of the crane that had snagged the cable. He does not stop at nothing, not "stuck" as we say around here. If only your presence, Antonio, helps us to make this world a bit better in humanity! Thank you for meeting with you, Antonio. 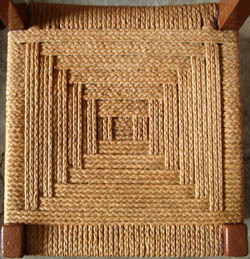 Today, like every day I have began to weave the "pleita". I did it like you taught me Antonio. I remembered those days when your life and your messages came to me without words, like a simple and honest life is woven. We didn’t speak... just enough so that I could learn everything I needed. Everything else wasn’t needed What a good school of neatness and patience with you, Antonio! Your life has been a Grace Antonio. I thank God for the blessing I have had with you and that I will continue receiving undoubtly. Today I live loneliness and responsability. Loneliness of your hand that I can't touch yet and responsability to get only half of your human quality, natural and small as you were. But I know that I keep the best thing: your good and pure spirit. Paco is a good man. Life and Murcia soil have made him, in company of his wife Pilar. 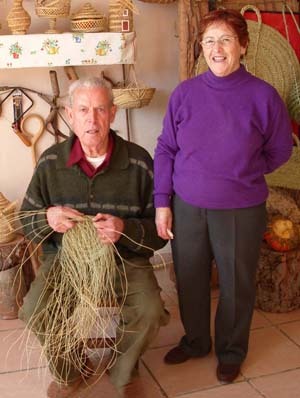 After being all his life working in the fields as shepherd and farmer, when he retired at 65 years old he decided to do something with esparto , with what he knew of esparto grass. And the reason was that he resisted that time went off with him. Surely he thought: "Now it is me who decide what I do", and so he started posing hands to give wings to his work. After being with him for a first day, I didn't have clear if he knew more about esparto or about Life. He has in his bones the fields, the mountains, the esparto itself. He has his roots in the earth, as the pine tree of his house. He is an authentic villager. "I don't know how we have been able to loose this. It was our entire life and it kept us away from hunger . Working with esparto we had enough to eat every day". "We have to think well about what we are doing". 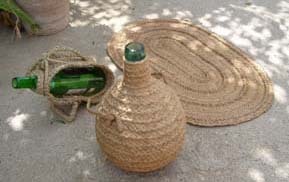 Esparto sandals ("alborgas"), baskets, ropes, carafes, "serones" (big baskets to transport soil, dung, etc...), "aguaderas" (structures to transport pitchers with water), mats, "barjas" (special bags), even clothes. Carts, in cold weather were materially wrapped in esparto, surrounding the box where people were sitting. Esparto was all, "it protected us from hunger and cold". After the every day work, with the light of an oil lamp (in early years ) and with a gas light (later on ) we repaired the worn pieces and created new ones for the next working day. At the same time, in the shadow of the night human relationships were shaped by the fireside. Reading friend, you are not in a novel, you are in the depths of a person between a lot of people that have lived this and are a bear witness to what they transmit. Paco plaiting by the fireside still and in this "History corner"
I arrived one midmorning, on May 16th; his calm appearance and the rythm of his walking already gave a premonition of something great. Adolfina was always by his side, paying attention to whatever was necessary. Immediately we started to talk the same language, I of course, as the artisan apprentice of "pleita" and life; I wish I could get only half of his human height, Lord! When I asked them if they had always lived in the cave, I couldn't ask for further aclarations; immediately, their eyes and gazes answered, even before their mouth could (opposite me Dersu Uzala's pure and clear image): "Thanks to God, I have always loved people, and they have always loved me, here I have my soil, my animals, my people... I have everything and I don't need anything else..."
Lastly I had the joy of learning a beginning of weaving "pleita" that distils more than beauty. Distils harmony and rural finesse, an entire lesson in design and neatly edged aesthetic, exquisite made. 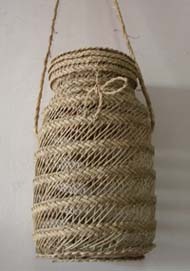 Even there was more, I also could learn to weave a 35 strands "pleita" with a clean facture which units art and intelligent architecture together, undoubtly, a way of working truly born of the earth where Eloy walks on. Soil that seduces and feeds his pure and generous soul. Soil that is... "A Present". Thank you Eloy for your wisdom, your patience and your bright print. Paco. The place Mazarrón saw Paco's birth in 1926. He is born from soil and for soil. Since then, he started to weave slings to lead the sheeps when they distracted. Agriculture life has been his teacher; he has dedicated a lot of great efforts and worries to it. 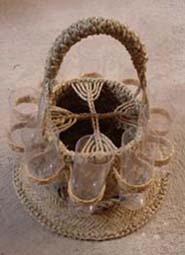 As time went by it was necessary to weave "uncieras" (esparto work used to avoid injures to oxes), "cejás" (a piece of esparto used to hold burdens to animals), reins, "aguaderas" (to take pitchers with water), baskets, carafes and every kind of tools used in agriculture work. When his laboral age seemed to take stock it is then when his craft, slept by other circunstances, starts awakening. 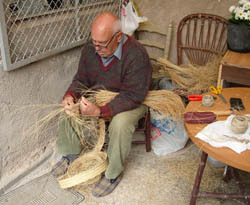 It is now, having more time, when his capacity in creative work starts on and he weaves, almost without resting, his favourite esparto work: "pleita". And without pretending it, he becomes a legend: "The marquis of pleita". And again Life amazes me with such generous souls as Paco and Josefa; "In case you didn't know and for what you need, bear in mind that you have found here a family". This is not habitual. Paco and Josefa seem to be from another far century than XXI. At the beginning, their welcoming startled me. But, in spite of this initial doubts, the following hours cleared it to me. In some moments I didn't know if I was teacher or pupil. Paco's humility was amazingly discreet and reserved. He seemed to be always in the edge, like if the pieces of esparto that he showed (which have damaged his fingers) were not his. And yes, Paco is another present from Heaven. It is a grace to have the joy to have been with him trough such a deep day, which seems not to be enough. Thank you for your person and your generous soul, Paco. It is a cove of peace to have met you. Custodio.Thanks Life again for such a present in the persons of Custodio and María. Again I find by the edge of the path with two good and needed persons. We met in Albacete and the day was endearing. These are not hollow words and deeds show it: meal for two became meal for five. Being not pretentious but adjusting us to reality, the miracle of the real meeting was there; neither did we employ or did we do anything magical. Meal was simple and from the soil like the esparto itself, rude and rustic, that gathered us. Perhaps because esparto offers gathering, gives warm, joins and weaves from the silence, souls anchored in the depth of the earth. Every day I experience more and more that with esparto I am plaiting my soul in the meeting with people like Custodio and María. Lastly, this is so and there is not much to add except Custodio is also a master with "recinchillo". It is amazing the exquisite and delicacy Custodio plaits this work; very few people keep and do it. Thank you Custodio for being there. Thank you María for being by his side supporting and favouring this treasure you keep , maintains itself alive in the esparto artisan tradition. Manuel. 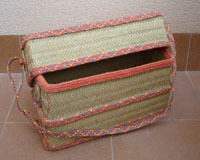 Some time ago I learned the comb weaving but I didn't recived precised details of this work. Meeting Manuel had made me this easier, thanks to the investigation work of Carlos. 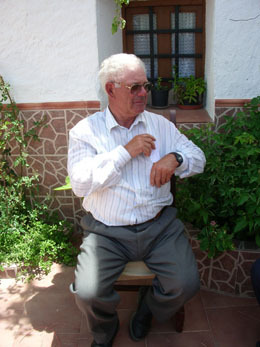 Manuel Lores Segura is a simple man who lives in Almería among his family. Since always he has worked in esparto due to necessites of his life with livestok. 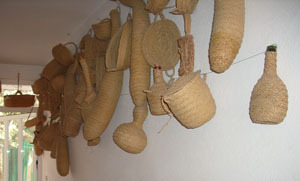 The enormous herds of sheeps and goats demanded him esparto tools for the everyday work. 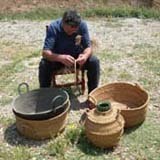 At the same times, days in field, among livestock allowed him the time to tack the weaving of "pleitas" and "soguillos" for domestic tasks. 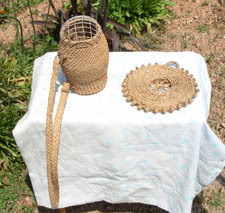 He works very well the comb weaving and has preserved it for neglect this patient and peculiar way of weaving esparto, very similar to weaving other vegetable fibers like wicker, although it has its corresponding variations. Victoria.There was missing a woman in this tribute and I like it a lot that it may be Victoria (Victoria García Moreno). 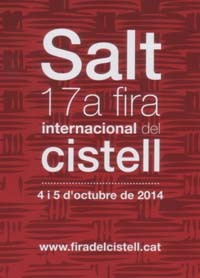 I like it, because Castilian as she is, like I am it makes me somehow reunite with my land. The vitality that transmits Victoria is overwhelming. I came home with some sense that we are often living on the surface, coming back after having met with the deep roots of Spain, Spain that seems to live on the margins of history. The depth of Victoria is as deep as her beloved Liétor. Halfway between the river valley "Mundo" and the "Atalaya" of the village, suspended there in its headlands. Victoria defines her passion. 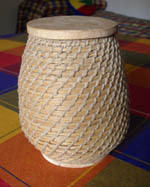 She learned to weave "cofines" when she was 12 years old when the young master of the mill hired a man from Mula to theach the letuarian women. With 14 years she was a "cofinera", in "interim staff", as she says. His first "mobile phone" was a well done Cofin, which licensed her. Afterwards, family needs did forget her about esparto weaving, and her life was centred in her family, her sons and daughters. The same passion moved her, 70 years old, to return to weave esparto grass, as well as more than countless other handicrafts (painting, decorating, crafts). 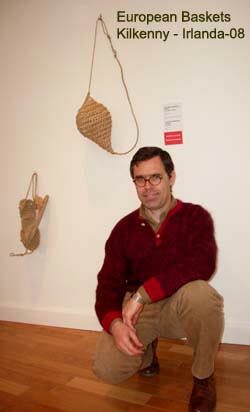 But it was esparto weaving that took most of all her interest. As she says her work wasn't rendible and then they put her in the "Mazos" (terribles for its danger) to be more "profitable" like everything in life it depends on the angle from which to look at someting. She works slowly, paying a lot of attention and working carefully, her work shows it. Meticulousness and dedication are the other side of the commercial and productivist currency. 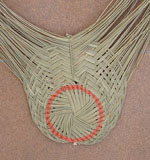 In fact she taught us the difference between "parao" weaving and weaving "embutío". Thanks Victoria for your hospitality, for your attention and your delivery. The meeting with Florencio only has confirmed me that life is something incomprehensible. For more laps we give it always are failing reasons to understand reality. I was looking the other day for somebody and I found another person; well, actually I found two because Florencio forearmed in size and generosity. When he saw me nosing in his site of course immediately he "had me by" and suspected that "something" I knew from Esparto. Gradually the meeting was gaining in intensity and we began to sail in a well known sea: artisan work, both in its calm beaches and in its stormy waters. Florencio already is some years trapped by the Esparto world but his real journey began at the age of 10 year old in the land where he was born, La Abejuela (Albacete). 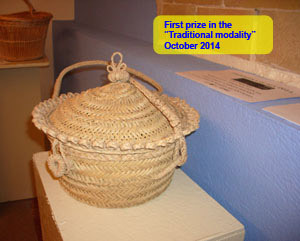 In his childhood –the years 50- it was something natural to peasant life to dominate the Esparto craft. The esparto labour was more need than craftsmanship. 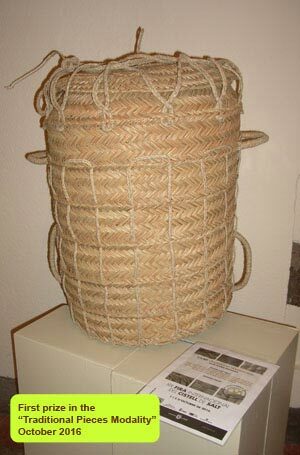 "Espadrilles", baskets, "panniers", "jarpiles", carpets, "queseras"... Esparto crossed the life of every villager. Due to circumstances his father never learned these tasks; curious. Somehow these knowledge fell in hands of Florencio as one of the six brothers who they were. His mother occasionally dissuaded him to learn more about esparto, but then always there was his father pointing back in the shade, "Let him, that he is taught about it maybe someday he will need it". And for sure he has needed it! Each time he takes a aspartic he is concious of the presence of his mother as well as his fathers. Who knows! 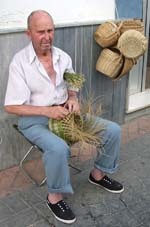 Perhaps if his father had learned as used to be, Florencio wouldn’t have put interest in esparto craft. Although , Mystery remains and affirms that we know nothing about life. I do know how honest and generous is Florencio. It's been a pleasure all the hours we spent together. 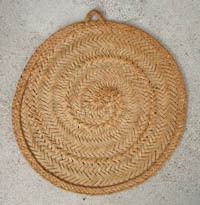 So striking is the strong and solidness of his weavingwork despite being small. It’s curious to see the self-taught process that Florencio follows in his work. Stumbling up with people like him in the field, returns in a huge gift that brings us back to earth, the vital, vitalizing, regenerating humus. The hours are passing without going over. We experience time that is out of time. A far beyond the here and now. Loreto. The sites of Cuenca are quite cold in winter but many people remain warm and friendly as Loreto. I was very pleased to meet people from Cuenca working with esparto. It's like coming home, back to my land . 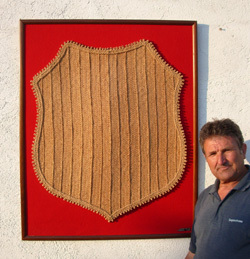 "La Manchuela conquense" challenges its inhabitants just as esparto challenges Loreto in his work to maintain Esparto craftmanship. It is a fine and very meticulous craftsmanship that is woven with care and dedication. 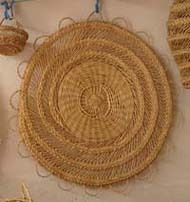 From youngest on started his expertise with esparto because from a young age he dared in a small domestic situation starting to show his ability weaving "pleita" with esparto. 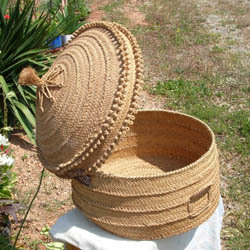 And besides, the pleitas which he sews with sogueta give a body and a remarkable consistency. Lean out his entrance door is actually a luxury and a very nice welcome. 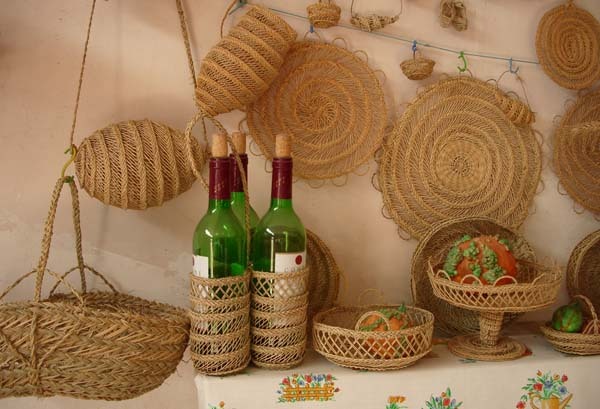 The walls of the hall are a multifaceted tapestry of Esparto with "cuevanillos", "baleos", baskets, small baskets, giant baskets, carpets...and the most precious and curious piece: "the sarrieta". I do not know what was better the excellent piece of artisanwork (relatively easy to weave ) or the explanation of Loreto. By midafternoon and when his father had given instruccions to him at home, the sarrieta is assembled and placed in such a way that the animals can regain strength. 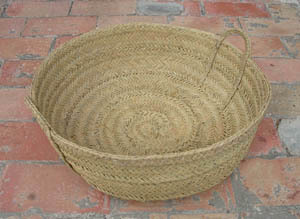 Before "the sarrieta" had served as a blanket to ward off the floor while having lunch of the day or enjoying any meal. And as it was the forerunner of the removable, once unleashed it returned to the back of the beast on the saddle. I found it an ingenious process and very enrichening the explanation of Loreto. 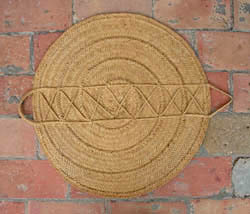 The work of Loreto isn’t being an esparto craftsman, because it was never a craft in the village. His artisan work is more than a job, it is his task to collect the vibration of the earth and sort it out rhythmically in the heat of the fire on long winter nights and to bustle with comings and goings of his fingers on the esparto that, submissive, go zig-zag drawing his... Slowly, cold night falls.